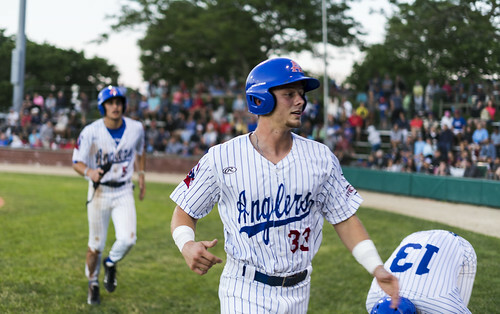 The Chatham Anglers (10-10-2) experienced their worst loss of the season Sunday, a 10-1 drubbing at the hands of the Eastern Division-leading Yarmouth Dennis Red Sox. The loss is the team’s third in the last four games. But there is no time to harp on the defeat. Chatham has eight games in the next seven days — half of the games are on the road and the other half at home. 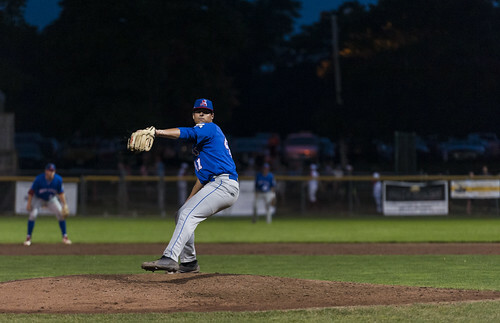 This big stretch of play begins with a game against the rival Orleans Firebirds at Veterans Field on Monday at 7 p.m.
Anglers manager Tom Holliday has said he is in search of a second closer. Who on the current roster can fill that role? David Schneidman: Greg Veliz (Miami) has separated himself as the first-choice closer for the A’s. However, the right-hander can’t be available every night, and Holliday has not implemented a second go-to guy in the ninth inning. The A’s manager gave Tristin English (Georgia Tech) a chance to close on the Fourth of July against Orleans, but he conceded a leadoff double which started a three-run inning. English is slated to get another chance on the bump but is unlikely to permanently fill the role. John McMillon (Texas Tech) is most likely to become the second closer. With all the talented arms in the bullpen and bats in the dugout, it is unlikely that McMillon — who is a two-way player — will get frequent appearances on mound and at the plate. The right-hander fits well in the second closer spot. It would give him a more defined role on an Anglers team where he has yet to be given a set responsibility. Peter Warren: McMillon is definitely a good option and can thrive in the second closer role. He picked up five saves as a reliever his freshman year at Texas Tech and made five appearances out of the bullpen this past spring. He has the experience coming in during tight-game situations and can also be extended for more than one inning, something that Holliday has done with Veliz multiple times. Nick Scheidler (UCLA) will continue to see his role as a lefty-specialist out of the bullpen, but it will also be interesting to see if his role expands. For the first time all season, he pitched more than an inning Sunday and had a really solid outing. Scheidler threw two inning, allowed no hits — he did walk three batters — struck out two Red Sox hitters and induced a double play. Even though it was in a blow out, Scheidler did show the ability to go for multiple innings. Holliday recently altered the Anglers’ warmup routine. What changes were made and how will they impact in-game performance? DS: After consecutive scoreless outings against Orleans on July 4 and 5, Holliday decided to give his hitters incentive during pregame batting practice, as he believed the lack of aggression during cage sessions translated to poor in-game at-bats. Rather than taking their hacks, stepping out of the cage and standing in line waiting for their next turn, players are given scenarios by Holliday, who stands directly behind the cage, as they bat. Now, before the pitch is thrown, Holliday shouts the number of outs and where baserunners are so the hitter can narrow their focus on where to drive the ball. It is up to the batters to hit the ball to the gaps and hypothetically advance the runners. Blake Sabol (Southern California) said he noted the need for increased intensity during batting practice. PW: Holliday has put a major emphasis on bunting recently. The team has only four sacrifice bunts on the year and few, if any, successful hits off of bunts. During batting practice Saturday at Veterans Field behind the turtle cage, there was a bunting station set up. Assistant coach Daylon Monette fed baseballs into a pitching machine for players to practice all different types of bunts up both the first and third base line. Sunday’s game at Y-D marked the halfway point of the regular season. What are the main takeaways from the first 22 games? DS: Despite having their full offensive arsenal on the Cape since July 3, the A’s are yet to find a consistently performing lineup. Just four Anglers players have appeared in 20 or more games this season, as player transactions and slumping batters have forced Holliday to shuffle the lineup each day. John Rave (Illinois State) and Greg Jones (UNC Wilmington) have primarily occupied the two spots at the top of the order while the three-through-nine-spots have seen a rotation of hitters throughout the summer. Spencer Torkelson (Arizona State) began the season as Chatham’s go-to three-hitter, but his departure for Team USA on June 25 forced Holliday to use English in the three-hole. English went on a three-game tear, blasting three homers in as many games from June 26 to 29, and has recorded a hit in 15 of 19 games on the summer. Michael Busch’s (North Carolina) arrival on June 3 has proved beneficial for the Anglers, as the first baseman tallied six hits in his first four games. Despite the quality at the top of the lineup, it will take some more tinkering and observation from Holliday before Chatham’s best lineup is assembled. PW: Chatham’s pitching staff is full of top-of-the-line arms. Despite giving up 10 runs to Y-D on Sunday, the staff is the best in the league in numerous statistical categories, including batting average against (.198), slugging percentage against (.282), WHIP (1.15), hits allowed (138) and earned runs allowed (71). In some of those categories, the A’s are leaders by a significant margin. For example, the second-best team for hits allowed is Falmouth with 167. Headlining the staff through the midway point has been Jeff Belge (St. John’s), Davis Daniel (Auburn), Alek Manoah (West Virginia), Troy Miller (Michigan) and Veliz.. Every Chatham pitcher has had at least one outing where their skills have been on full display. Even the arms Holliday has had to send home, like right-hander Colin Peluse (Wake Forest), showed the ability to pitch successfully on the Cape. Going forward, it will be interesting to see how innings limits and extended outings change the rotation. If starters begin to pitch into the sixth and seventh innings, that means the “second starter role” will become less prevalent. Who becomes a starter and who becomes a reliever will be interesting to look out for in the future.